Pictured above are members of the 2017 Ohio Valley Conference champion Gallia Academy volleyball team. Kneeling in the front row, from left, are Hunter Copley, Alex Barnes, Maddie Wright, Peri Martin and Arianna Jordan. Standing in the middle row are assistant coach Kaci Cooke, Taylor Burnette, Katie Carpenter, Ryelee Sipple, Megan Bailey and head coach Janice Rosier. Standing in the back row are Aubrey Unroe, Grace Martin and Ashton Webb. SOUTH POINT, Ohio — An outright three-peat. 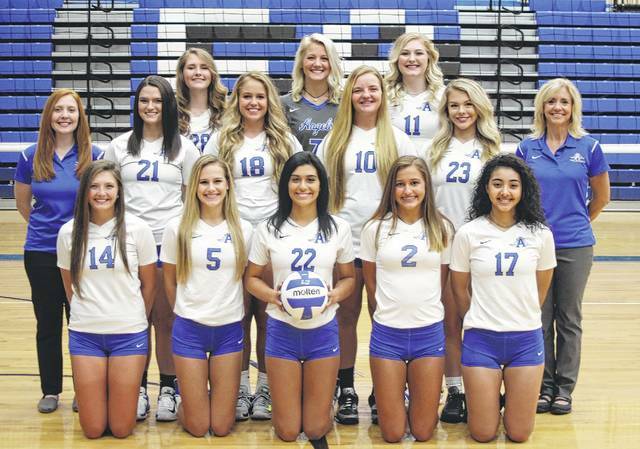 The Gallia Academy volleyball earned its third consecutive outright Ohio Valley Conference championship on Tuesday in Lawrence County, defeating host South Point in straight games. Gallia Academy (20-1, 13-0) — winner of 28 straight league matches — had the lowest side-out percentage of the night in the opening game, as each team won 10 of South Point’s 20 serves. The Blue Angels made up for it with a 92 percent serving rate, the best of the night, and seven of their 15 total aces. GAHS won the first by a 25-20 count after recording nine kills in the game. The Blue Angels allowed the Lady Pointers to record eight service points in the second game, but Gallia Academy claimed 14 points, with four aces. GAHS pounded 10 kills in Game 2, winning by a 25-17 final. The Blue Angels finished the night with its best side-out percentage, 69.2, allowing just four service points to the hosts. Gallia Academy had 10 kills and 16 service points, including four aces, en route to a 25-12 victory in the third game. For the match, Gallia Academy had a 56.9 side-out percentage, winning 29 of the Lady Pointers’ 51 serves. The Blue Angels won 62.5 percent of their own serves, claiming 45 total service points. GAHS boasted a serve percentage of 86.1 for the match and came up with 41 digs. The Blue and White committed a total of 10 serving errors and 17 hitting errors in the win. Ashton Webb led the guests wth five aces, followed by Taylor Burnette, Ryelee Sipple, Hunter Copley and Peri Martin with two aces apiece. Alex Barnes and Katie Carpenter both contributed an ace to the winning cause. Webb also paced the Blue and White at the net with 12 kills and three blocks. Barnes finished with six kills and five blocks, Peri Martin added four kills, two blocks and a team-high 20 assists, while Copley earned four kills, one block and a team-best 10 digs. Aubrey Unroe finished with three kills and one block for the victors, Carpenter chipped in with two blocks, while Sipple posted one block. The Blue Angels also topped SPHS in straight games on Sept. 12 in Centenary. GAHS — which is ranked tied for 15th in the latest OHSVCA Division II Coaches Poll — will return home to finish the regular season on Thursday against Chesapeake.